Welcome to Katfrog's Corner: It's a Bird, it's a Plane, It's a Drone?? It's a Bird, it's a Plane, It's a Drone?? While drones normally bring up mental images of secret military operations and hoverbikes seem very back to the future, several companies are attempting to create these vehicles for commercial and personal use. A drone might someday show up at your house delivering a package; or you might one day race your friends across a beach on a hoverbike. It all depends on how fast the technology develops and if we can overcome some inherent problems. Well, it's more that Google built some for their latest from Google X - Project Wings, a new drone delivery system. For those who don't know, Google X is a division of Google that attempts to do the impossible. They experiment with crazy ideas, learning along the way. By "learning along the way", I mean that Google doesn't expect all the projects to succeed; they know that a lot will never make it out of the lab. But by allowing their people to try, Google also allows them to shine when they get it right. For example, Google X developed their first driverless cars. Now, the team is working on creating viable drones. The following video shows what they've done so far. Google went to Australia (after being shot down by the FAA) to test their new drones. Boasting four propellers and the ability to lift off and land like a helicopter and fly like an airplane, these drone provide a cargo hold that carries about 3 lbs. worth of small items. Currently, Google planning on deploying these drones to disaster areas where the roads are impassable. The drones can be used to transport small but extremely useful items, such as medical supplies, medication, or batteries. Turning science fiction into science fact, several companies are working on creating real hoverbikes. While hoverbikes might one day become aerial ATVs, currently it is impractical to create hoverbikes that would be usable as everyday transportation due to the physics of the situation. You see, the designers need to balance the weight to power ratio. The more a hoverbike weighs, the more power it needs to lift off and hover. But power comes with batteries or a fuel tank, which in turn add to the overall weight. Currently, a normal-sized person can only ride a hoverbike for 45-85 minutes before needing to refuel or recharge. Plus, hoverbikes are extremely loud (due to the turning rotors), unable to make a sharp turn, and prone to drifting in a strong wind. Despite these obstacles, Aero-X and Malloy Aeronautics plan to release recreational use hoverbikes in the near future. 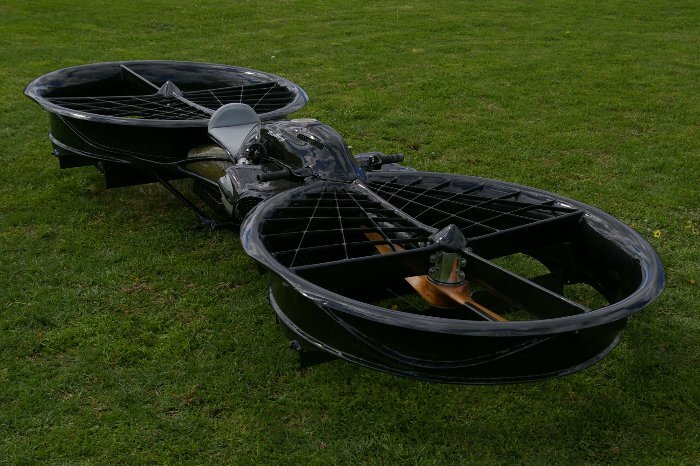 The other big company in the hoverbike market is Aerofex. You can buy their hoverbike, the Aero-X, for delivery in 2017 today, with a variety of colors and features to choose from. They even offer whole vehicle air bags, for those worried about safety. To work properly with the FAA, Aerofex limits how high you can hover to 12 feet off the ground (though to be honest, I'm not certain how they are implementing this). Any higher and you need a pilot's license. Aerofex released the following video, showcasing what their hoverbike can do. I've heard talk about using hoverbikes in emergency situations, to get help places where roads are not available. But the limited flight time makes me doubt how useful a hoverbike would be. Otherwise, I can't wait to see where the next level of recreational transportation takes us.